I think I’m a few years late getting on the Jojo Moyes train, but after seeing this book pop up on my “Recommended Reads” list more than once I was delighted to receive it as a birthday gift! It took me longer to read because real books don’t come with backlights like ebooks do, but I found myself picking it up and chewing through it whenever I had the chance! I wasn’t sure what to expect when I started reading it, to be honest. Love story? Survival story? The subject matter is a touchy one, even four years after Moyes penned this book, but I think it was “handled” very well. It wasn’t tip-toed around, but it wasn’t in-your-face either. I’m so glad that Lou & Will’s romantic feelings towards one another didn’t overshadow the “real” story of the book. As much as I wanted Lou & Will’s romantic storyline to develop more, I’m glad it wasn’t the main focus. Is it obvious that I loved the characters? Lou’s free spirit balanced out Will’s (understandable) stubborn arse behaviour, and I enjoyed their friendly banter. Honesty time: I never expected Lou to change Will’s mind. Did I want her to? Absolutely. As much as I believed that Lou could make Will unbelievably happy, I understand that there would always be something missing for Will. Will’s ultimate decision just goes to show that despite how “happy” a person may seem on the outside, you cannot deny how they actually feel on the inside – especially when they go through something as traumatic and life-altering as Will did. Sometimes, no matter how hard you try to help a person see the brighter side of things, a part of them will always dwell on the life that’s no longer theirs. It hurts the heart, but a person’s choice. I will not judge Will one bit for the decision he made. I’ve already added the sequel to me “To Read” list and I’m looking forward to reading more about Lou and her life after Will. I gave Me Before You 5 stars out of 5. 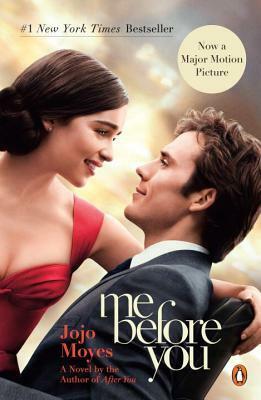 Me Before You is my favorite book! As odd as it might be to say, I thought the ending was “perfect” because, like you said, Will would always feel like something was missing from his life, no matter how happy Lou made him. I couldn’t see any other way for things to go that wouldn’t have felt forced. I’m seeing the movie tomorrow night and have all of the tissues ready! Oh I LOVED this book. It was the best book I read in 2013 and remains one of the top 3 books I recommend to people. The sequel was good, but of course not nearly as good as the first one. Unfortunately I have tried reading about 3 other Jojo Moyes books and just haven’t enjoyed them the way I enjoyed Me Before You.